The Healing Channel: Don’t Throw Away Another Used Tea Bag Until You Read This! Don’t Throw Away Another Used Tea Bag Until You Read This! For some people a tea bag is something that you use once, and that’s it. On to the next one. Then you have the people (call them what you want) who will save the tea bag, just to get more tea out of it to drink, by using 2 to 3 used tea bags to make 1 more cup of tea. It is true that after you use the tea bag for your cup of tea that there is still some tea residue left within the little bag. But so that you don’t feel wasteful, I will reveal to you what other uses that used tea bag can serve. So I would always get the maximum use out of my tea bags by drinking a large cup of tea. More so because I don’t like anything too concentrated. But for those of you who don’t want a large cup of tea, there are many uses for a used tea bag. Draw Out Infections: Pinkeye, canker sores, fever blisters, plantar warts, or any other similar infections to draw out the infection, reduce pain, and help speed the healing process. Soothe Irritated Skin: Place them over tired eyes to ease discomfort. Massage over sunburn to cool skin and reduce inflammation. Place against bruises to ease discomfort and help speed healing. Gently rub over stings and bites to draw out the toxins and lessen pain and swelling. Soak Your Feet: Add used tea bags to warm water and soak your feet to neutralize foot odors, soften calluses, and nourish your skin. 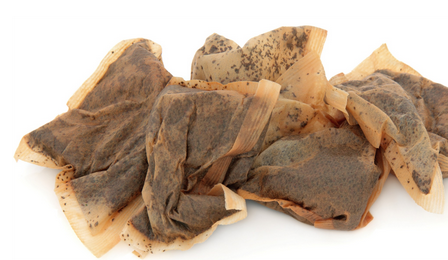 Degrease Dirty Dishes: Soak your dishes in warm water with a couple of used tea bags to break up grease. Will also help to loosen any stuck on food. Deter Household Pests: Mice, Spiders, Ants etc. Tuck used tea bags into cupboards, pantries, and in any areas where these pests may enter your home to make them think twice about coming inside. Use peppermint tea for this or use peppermint essential oil on tea bags. Air Freshener: Add a few drops of your favorite essential oil to dry used tea bags to create air fresheners for your home, office, or vehicle. Also, because tea leaves absorb odors, these creative homemade air fresheners will work double-time to keep your living areas smelling great! Neutralize Household Odors: Used tea is also great for removing lingering odors from your home. Mix dried used tea leaves into cat litter. Store pre-brewed tea bags in the refrigerator to keep it smelling fresh. Drop a few dry used tea bags into the bottom of your trash bins to neutralize bad smells before they can escape into your kitchen. Clean Carpets and Rugs: Use pre-brewed tea to clean and deodorize your floor coverings. Store used tea bags in the refrigerator in a cup of water to keep them from spoiling until you have enough to cover the surface you want to clean. Then open the used tea bags and let all of the leaves dry until they are still slightly damp, but no longer wet. Sprinkle the loose tea over rugs and carpets and leave them until they are totally dry. Then vacuum them up or sweep the dried tea leaves away. Feed Your Garden: Re-brew used bags in a bucket of water and use the resulting weak tea to water your plants and protect them from fungal infections. Alternately, open up used tea bags and sprinkle the damp leaves around the base of your plants to fertilize the soil and deter garden pests. You can also add previously-brewed tea bags to your compost pile for a boost of nutrients. Since learning about this I've really put this to use, especially because I drink a lot of tea. You can take these ideas yourself and get very creative. So in conclusion you don’t have to try to use the used tea bag to make another cup of tea. That’s just (call them whatever you want)… You can now save that tea bag and re-purpose it to fulfill another useful need.